Can Chris Clare Save Baseball? About the time I started losing interest in baseball, Chris Clare, a minor league player in the Baltimore Orioles’ farm system, was assigned to the Frederick Keys from the Delmarva Shorebirds. Clare’s “promotion” in July 2017 likely wasn’t more than a transactional footnote to many beyond his family. A six-two, 175-pound shortstop, Clare was originally drafted by the Orioles in the 21st round of the 2016 amateur draft. He received a signing bonus of $65,000, which doesn’t seem that bad, but frankly Clare may be baseball’s equivalent of military cannon fodder: one of the thousands of kids drafted into professional baseball who will toil for years in obscurity for meager wages and never see the inside of a major league ballpark without a ticket. 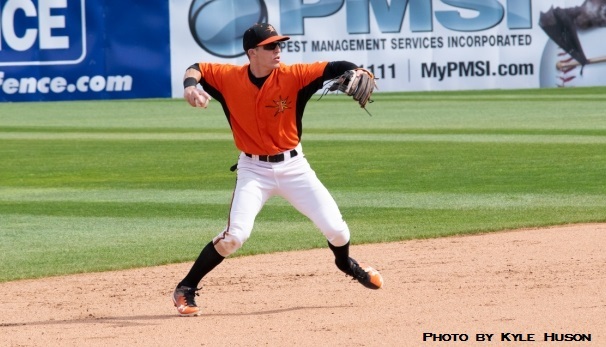 When Clare was added to the Keys’ roster, it appeared to be a corresponding move to Ryan Mountcastle’s advance from Frederick’s Class A team to the Orioles’ Class AA affiliate Bowie Baysox. And while both players technically stepped closer to the major leagues that day, Mountcastle’s rise was more noteworthy. Ryan Mountcastle, drafted in 2015, was taken in the first round, the 36th amateur player selected overall. Then a high school student, Mountcastle received a signing bonus of $1.3 million and has since been mentioned during Orioles’ broadcasts as one of the organization’s top prospects. Chris Clare doesn’t draw that same attention. I may not have noticed his arrival to Frederick on July 20, 2017, but I happened to be in the seats when he first trotted onto Nymeo Field in a Keys’ uniform. Perhaps it was an over-active imagination on my part, but that night I felt I could sense Clare’s hope radiating from the diamond into the half-empty stands. After all, someone in the Orioles’ organization had noticed him and believed he could play at a higher level. His dream, while still distant, had just moved closer to his reach. I found myself rooting for Chris Clare. Perhaps because he might become a classic underdog story. Or perhaps because my interest in major league baseball had soured, with so much of the game becoming talk about players paid tens of thousands of dollars per game to strike out. Or maybe because the Orioles were finding even more ways to lose. Or because minor league players (until reaching a major league roster) are often not even paid minimum wage. Whatever the reason, I became a Chris Clare fan. Over a year later, I regularly check box scores to see how he plays. And I follow the Frederick Keys. Date nights now include a half-hour drive to Nymeo Field, where parking is free and easy, we can get reserved seats behind home plate for $12 on game day, and (at least on weekday nights) there often isn’t anyone sitting alongside us. Every so often, a major league player comes through Frederick on a rehab assignment. (We saw Chris Tillman throw his last pitch for the Orioles’ organization in a Keys’ uniform.) But it’s the below-minimum-wage players I root for. The kids making a couple thousand dollars a month trying hard to rise to the top. The Chris Clares who have rekindled my interest in baseball. Last night (August 18, 2018), Clare went 0-4 against Lynchburg and struck out three times, dropping his batting average to .218. Not a good night—or an especially stellar season. But most every summer day brings another game. More chances. Come on Chris. You may not be able to save baseball for everyone, but you’ve saved it for me.